I have attached what you need to this reply. Just download it to your Desktop (where ComboFix should be) and then drag and drop the file directly onto ComboFix. Post the new log when made and let me know how your system is running. Hi there....no worries. If you have any questions please do ask. That is what I am here for. Your system is asking if you want Internet Explorer to be the default browser because with some of our tools, there are settings that get set back to default. Go ahead and give the system a good run around and then let me know later or tomorrow how it's running. If everything seems ok, we can remove our tools and you should be good to go. You might just try a reinstall of filehippo and see if that fixes things up. Hi Jeff,Yes that fixed it.I tried before by uninstalling the desktop icon and reinstalling that! Duh! LOL So the computer seems to be working OK now do I go ahead and delete the desktop files,Combofix etc...? Hi Jeff,When I press windows button + R together the start menu appears? instead of run text box.Ive been trying to get through to Paypal resolution since yesterday but but it keeps saying the message was interrupted,then a resend box comes up I click that and a try again box appears? I dont know if its the computer or the website? Its OK Jeff, I got through to Paypal in the end. So your Run keyboard shortcut is not working still? Hi Jeff,I tried again by pressing Win + R multiple times,when I do that sometimes after the start menu it will show search results for R, and sometimes the run box will magically appear? It showed CFScript txt uninstall already there from my last attempt but because it didn't work previously I went ahead and deleted the Combofix icon from my desktop and program. Sorry for any delays....my connection at my house has been really funky!! Not sure how long I can stay on. Sorry to hear about your connection problem Jeff! I still have a problem with the Windows Button + R when I press them at the same time nothing happens most of the time and when it does it goes to the start menu,press again and it goes to search of R. What would cause this? I have a new "AV Labs" USB keyboard about 2 months old. Edited by redrooster, 18 March 2014 - 09:43 PM. 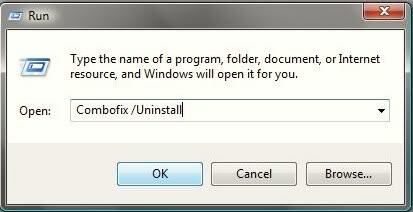 You might try to uninstall and then reinstall any software associated with the keyboard and see if that helps.